When it comes to haircare, I’ve struggled to find premium hair brands that don’t dry out my hair. Having fine and thin locks means that the strength of premium products often dries out my strands and makes my already flat hair get flatter. It’s not a good look. However Bumble and bumble are one of the few premium brands that have the right balance in their products, which means that I’m always excited to try out their new lines because I’m not at such high risk of my hair looking lifeless after use. Their latest release was a two product extension of their Hairdresser’s Invisible Oil range – a collection I’m partial to already. If you’ve got dry hair in need of a moisture kick, then I highly recommend this range for you. If you’ve got coloured hair, highlighted hair, or hair that’s lacking life then I also think you’ll want to give this a go. My hair is coloured and highlighted…and then coloured and highlighted some more. I’ve been colouring my hair since my mum let me have highlights at age thirteen, so to say my hair can be quite dry at times is an understatement. I’ve also just got back from my holiday so my hair’s been exposed to higher UV and sun damage/fading. Basically, there couldn’t have been a better time for me to try the new Invisible Oil products out. The masque is designed to add some TLC to your hair, and I like this above other hair masques because you apply it when your hair is dry. Yes, you did read that right. 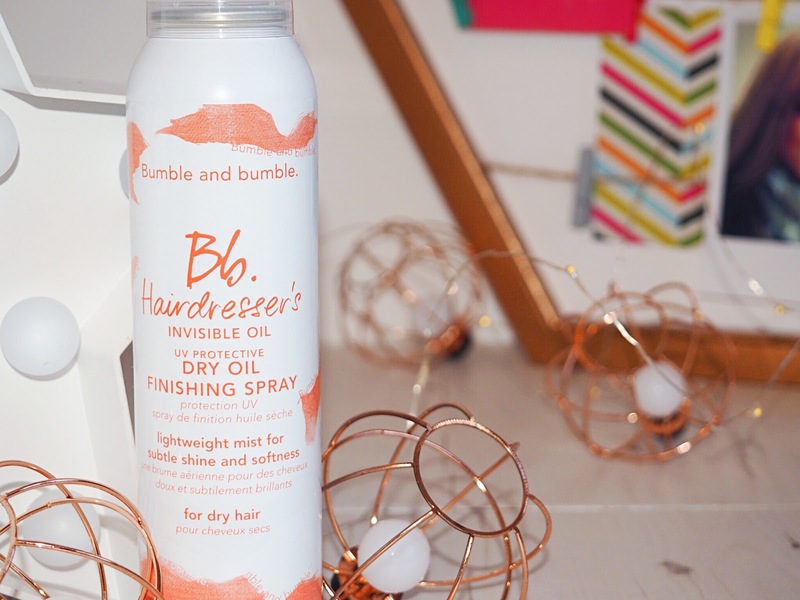 Bumble and bumble say it’s better to apply it dry because hair absorbs more moisture that way. Who knew? Rub the masque together in your hands to warm it, then apply in a comb like motion from root to tip. I like to then twist my hair up and clip it back for 20 minutes or so before washing off. I do this in the evening because I can’t use anything too strong on my hair during the day, otherwise my strands throw their toys out of the pram and they go as flat as a pancake – and my hair sticks to my head. It’s not flattering. You’re supposed to use this weekly, but I’ve used it three times in two weeks and have loved how fresh and light my hair felt after each use. The Invisible Oil products are all featherlight and importantly to me, they don’t weigh my hair down. After using the masque my ends feel healthier and my hair feels like it’s had a vital moisture boost as it’s soft and shiny and basically feels like it’s got a new lease of life. It’s £32, but it’s good value because you don’t need much per application. It’s also a lifesaver in the current humidity as it works to de-frizz hair as well. I have face masks, body masks and all other kinds of skincare and body care masques, so it seems alien to me that I haven’t invested more time in masques for my hair. This has been a welcome addition to my pampering. Then there’s the Invisible Oil Finishing Spray – which is absolutely and hands down a fantastic discovery. It gives my hair an instant shine without weighing it down, so I’m spritzing it all over my head before leaving for work in the mornings and I’m not worried about it making my hair look or feel flat. It’s like the fixing spray you use on your face for your make-up. It keeps everything looking healthy, shiny, soft and perfect. I usually spray this over my hair when I finish my morning styling, and I then run my hands roughly through my hair for best results. Then I apply my make-up and finally add a quick layer of hairspray to hold everything in place and voila. It’s amazing how quickly this has become a staple part of my morning routine. My hair looks shiny and feels bouncy throughout the day and at £25 I will 100% be re-buying this. 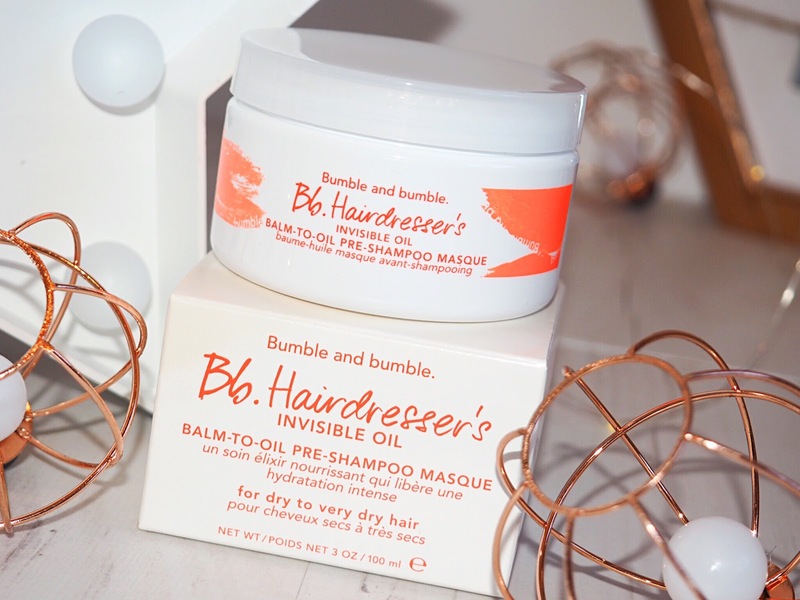 If you’ve got dry, damaged or coarse hair, or even just hair that’s in serious need of some pampering then trust that Bumble and bumble have got your back. The new collection additions are available exclusively in Selfridges from 28th September, and then widely available from 26th October. So it’s definitely one for your Christmas list. …But for now I’m off to sit in the bath with a magazine and let the masque do it’s thing!